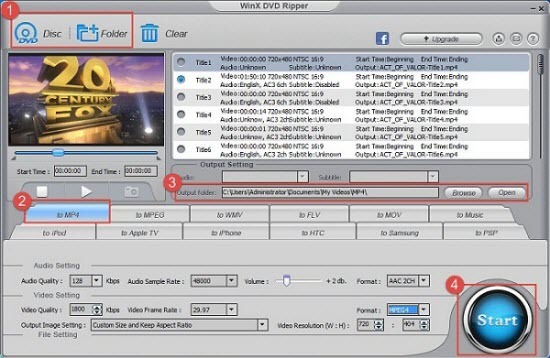 WinX DVD Ripper is highly recommended! • Rip DVD to MP4, H.264, MOV, FLV, WMV, MPEG, iPhone, Apple TV, etc. • CSS, UOP, RCE, region code and Sony ARccOS DVDs are supported. • Fast speed, high output quality, easy operation, 100% clean, free. How to fast rip and save DVD to external hard drive for free in 4 simple steps on Windows (10) or Mac. Large DVD collections can occupy a large amount of space of your living room. Copying DVD to PC/Mac also eats up much space of your computer. Therefore, ripping and saving DVD to external hard drive with original quality is a good way to release space of your computer and lay aside your DVD discs. WinX DVD Ripper, a top free DVD ripper for Windows 10/8/7, enables you to easily backup DVD to external hard drive. It is capable of ripping DVD to MP4, H.264, MOV, AVI, WMV, MPEG, FLV, HEVC, iPhone (XS/XS Max), iPad, Android, and more. This DVD ripper freeware also supports copy-protected DVD as the input and can bypass DVD region code, CSS, Sony ArccOS, UOPs protections. For old scratched DVDs, you can also try this DVD ripping software to convert DVD to digital video file. You can also freely change video/audio parameters like video resolution, frame rate, bit rate, aspect ratio, etc. The platinum version also perfectly supports Nvidia NVENC/CUDA, Intel QSV, and AMD hardware acceleration to deliver an ultrafast speed (up to 5 minutes) in DVD to external hard drive copying process, and can smoothly deal with 99-title Disney DVDs and backup DVD to ISO Image file with intact data to store to external hard drive. 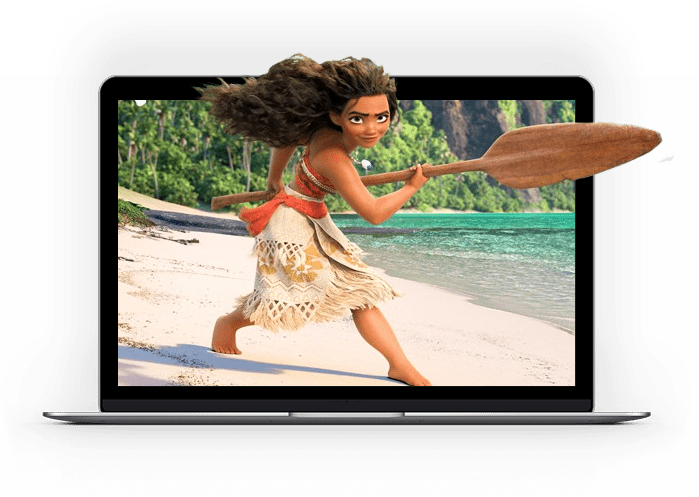 Get free WinX DVD Ripper fast downloaded and installed on your Windows 10/8/7 computer, if you use a Mac, free download the Mac version. Then follow the step-by-step guide below to fast rip and copy DVD to external hard drive for free. Run WinX DVD Ripper and click "DVD Disc" button to load DVD. This smart free DVD ripper will auto detect and tick the right DVD main title. And this is different with Handbrake. Handbrake takes a long time to scan the multiple DVD titles one by one and always chooses the wrong title. Choose an output format you like. Popular MP4, H.264, HEVC, MOV, AVI, MPEG, FLV, and many other formats are available. If you want to stream the DVD content to Apple TV, MP4 or MOV is recommended. Optional: 1) Cut DVD video clips, crop video to remove black bars, add external SRT subtitles to video, etc. 2) Customize video resolution, frame rate, bit rate, aspect ratio, etc. 3) Select preferred language and subtitle tracks. Connect external hard drive to computer. Then click "Browse" button to select the external hard drive as the destination folder. Hit "Start" to begin ripping DVD to MP4 or other chosen format for free and save DVD content to external hard drive. In this way, you can transfer the DVD media to external hard drive to save space for your room or computer. Buffalo MiniStation Extreme NFC, Western Digital My Passport 4TB, Adata SD700 External SSD, WD My Book Duo 4TB, Buffalo MiniStation Thunderbolt, Seagate Innov8 8TB, Seagate Backup Plus Desktop Drive 5TB, Western Digital My Passport Wireless Pro, LaCie Porsche Design Mobile Drive 4TB, iStorage diskAshur 2TB, Western Digital MyBook, Samsung Portable SSD T5, Samsung Portable SSD X5, Akitio Thunder3 RAID Station, Seagate Backup Plus Ultra Slim, Seagate Backup Plus Slim, etc. Use best fastest CUDA DVD ripper for Windows 10/8/7, WinX DVD Ripper Platinum, to rip any copy protected DVD (incl. new Disney DVD) to MP4, AVI, MOV, etc. at No.1 fast speed.